Time to pick a winner, and random.org decided that “mbeacom” was the winner! Congratulations and thanks for entering our giveaway! Look for more in the near future! It’s time to bring back the big giveaways here at NewbieDM.com, and thanks to Gator Games, this week’s entry is huge, it’s deluxe, it’s super, it’s… Madness! 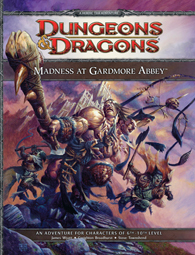 We are giving away a copy of the newest D&D deluxe adventure “Madness at Gardmore Abbey” to one lucky reader! How’s that for a giveaway? Only the cool folks at Gator Games make things like this happen. How to enter? Well, leave us a comment here on the post, and send us a tweet via twitter, to both @newbiedm and @gatorgames, and you are entered. It’s that simple! The contest will run from September 19th until Saturday September 24th 2011, at 11:59pm pacific time. Please take the time to go check out Gator Games, who make these giveaways possible. This is me sending psionic energy enabling me to win Gardmore Abbey. Thank you for the great contest Newbie & Gator Games! You doth rock! Oh neat! I got to play this at PAX this year and it was excellent. Would love to take a look at this. I’m in. Cool! I hope I win! I would love to inflict this upon my players! Yep! Please enter me into the contest! This time, victory shall be mine! I rolled a 3. Is there +mod for this? The adventure sounds well put together and I would be interested in checking it out. This is blasphemy. This is madness! This is terrific. I’d love to win a copy! I’ve been considering buying this, but it of course would be even better to win it. This looks awesome. I’m in. It would be madness NOT to join in on this contest! Tossing my hat into the ring for this great contest. Like everyone else, I would love to win! Thanks for the contest! In! This sounded intriguing the other day. I missed the chance to play this at PAX, but I heard awesome things about it. I’d love the chance to run it for my group. Yah, want. Thanks for running contests like this Newbie! Awesome giveaway! Hope I get a chance to win! oh me! pick me! pick me! Very generous of Gator Games to donate the prize and generous of you to present the drawing Newbie! Hooray for Gator games. I cant’t wait to drive some PCs insane at the Abbey. Hey! I’d love to win this give-away, the adventure looks great. The gnomish wizard chuckles with glee, he uses Otto’s Inevitable Command to bend the will of the person drawing the winning name. Regardless of the name drawn, the dominated person will read out my name and hand me the prize. My group is just at 7th level so this would be perfect! Thanks Newbie and thanks to Gator Games! Tweeted and now commenting – as required to win Madness at Gardmore Abbey! Count me in for a chance! Thanks to everyone involved. My son is a big D&D fan…Thanks for the great giveaway. More madness is always a good thing! You folks rock! Much love for the giveaway! Excited for this. Consider me entered. Thanks so much guys, you rock! Thanks for the contest! Crossing fingers! Sounds pretty awesome…count me in. I am intrigued by your idea of insanity for zero payment and wish to subscribe to your newsletter. Here’s my entry! Tweets forthcoming! Thanks for doing this! Love me some madness. I’m always up for a contest. Thanks! Fantastic, thanks for another cool giveaway! Consider me entered, please. I would very much like to win this. I would love to win a copy! thanks for arranging such a great contest. Looks cool! Loved the unboxing video. I’m so entering! I want it just for the “Deck of Many Things”! Deck of Many Things! Expect my tweets, I wouldn’t miss entering. ENTER me ENTER me ENTER me! I’d love to get this! May I have a copy, Please? I just checked out the unboxing video and this adventure looks great. Cant wait for the full review. This contest is madness, madness I say! I want the free stuff!!! Looks like a super cool adventure!!! Finally got a chance to start prepping this beast. It’s amazing. Thanks again Newbie and Gator Games!